Booking luxury Danube (Donau) River cruise vacations on German boats operated by A-Rosa, Peter Deilmann, and Viking can save money if less inclusive packages are preferred. Luxury Danube riverboat cruises marketed in international markets often include more meals and excursion and may therefore seem more expensive than cruise vacations sold in the European market. For travelers keen on arranging their own shore excursions, booking such riverboat cruises can save money. 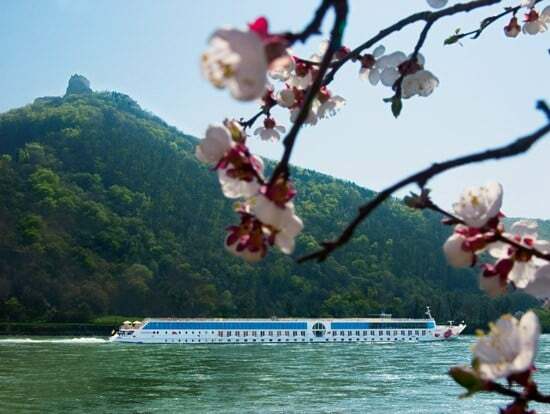 Popular rivers for riverboat cruises in central Europe include the Danube (Donau), Rhine (Rhein), Moselle (Mosel), Main, and Elbe with boats available from luxury to rather basic. Tauck World Discovery, Peter Deilmann Cruises, Amadeus Waterways, and Viking River Cruises are well-known riverboat cruise line operators with excellent reputations. All these companies market extensively in international markets and sell luxury cruises not only on the Danube but on the Rhine River as well. A-rosa is a fairly new German company currently selling riverboat cruises mostly in the German market while Peter Deilmann and Viking River Cruises also sell riverboat cruises in some markets without including transfers, shore excursions, and some onboard services. Booking such cruises can save money but remember to include additional expenses in the budget before comparing final special offers. Online reservations services often cannot book special discounts (such as child fares and special anniversaries) making it sensible to compare what is available at different service providers. A-Rosa boats are very luxurious but the atmosphere on Arosa boats are more relaxes and informal compared to other luxury riverboat cruise line operators on the Danube. A-rosa riverboats are advertised as floating resorts with an informal style and extensive sporting and fitness facilities often not seen on other riverboats cruising on the Danube River. A-Rosa has no dress code or formal receptions. Food is very good quality but all meals are buffet style with open seating in its restaurants. Soft drinks are free with meals. The wellness facilities on A-Rosa’s Danube riverboats include gyms, pools, saunas, whirlpools, putting greens, and extensive spa beauty treatments. Tipping is not an issue on A-rosa riverboats – all gratuities are included in the basic cruise fare. A-Rosa’s Danube River boats – the Mia, Bella, Donna, and Riva were built between 2002 and 2004 – are very modern with huge atrium windows. Arosa’s Danube boats can accommodate up to 242 passengers in relatively spacious cabins. Many cabins have French balconies. A-Rosa cruises on the Danube generally range from 4 to 7 nights and are mostly roundtrips from Passau. The minimum cost per person per night ranges from €75 to €160. A-rosa offers good early booking discounts but also very good last minute offers for cruises that don’t sell out. Note: Peter Deilmann suspended riverboat cruises from the 2010 season. German riverboat cruise line Peter Deilmann is famous its luxurious riverboats and excellent service. Peter Deilmann is also known for its gourmet food – six meals are served per day. The MS Mozart is Peter Deilmann’s main boat on the Danube River. This riverboat can accommodate up to 207 passengers in remarkably large cabins for a European riverboat. Many cabins are up to 20 square meter (215 square feet), which is close to relatively luxurious hotel room sizes. The MS Mozart even has a few inside cabins sold at quite a discount to regular outside cabins. Peter Deilmann riverboats often lack extensive wellness facilities. However, the MS Mozart is an exception with a pool, whirlpool, gym, and sauna. Due to the large size of the cabins on the MS Mozart, one child under 12 can share a cabin with two adults in some cabins. Children receive mostly 50% discount on the standard fare on many Peter Deilmann cruises. Note that many online reservation services cannot book these discounts and thus do not advertise them either. The MS Mozart’s Danube River cruises are usually one-week return cruises from the German city Passau. Cheapest fares on Peter Deilmann riverboats are from €130 to €170 per person per night. Viking River Cruises is the world’s largest riverboat cruise company. It mostly uses two boats on the Danube: the MS Primadonna and the MS Danube. The MS Primadonna is a 148-passenger catamaran sold mostly in the German market with German as primary onboard language. Cruises on the MS Primadonna are mostly sold without transfers, excursions, or drinks and thus often have a lower base fare than the all-inclusive cruises sold in English-speaking markets on the MS Danube. Viking’s MS Primadonna has two whirlpools, a sauna, and bicycles for onshore exploration. Cabins are generally 16 square meter (172 square feet) – many have French balconies. 25% off the cruise fare for special birthday or wedding anniversary – usually those devisable by ten or 25 in the year of the cruise. Family-friendly deals: one child can accompany adults in most cabins – free up to 3 years and half price from 4 to 12 years. In July and Augusts, a child under 12 may accompany an adult for free. Viking’s Primadonna Danube river cruises are mostly one-week returns from Passau to Budapest, or 12-day cruises from Passau to Fetesti in Romania or vice versa. Minimum price per person per night ranges from €80 to €150 (US$116-220). Many Danube riverboat cruises are return trips from the German city Passau but several routings are possible. Passau has many cheap hotels suitable for pre- or post-cruise nights even though easy transportation links bring Passau within easy reach of other major German regions. Vienna and Budapest are popular downstream destinations but it is possible to go upstream and through the Main-Danube Canal all the way to the Rhine River. Amawaterways, for example, has a 21-day Ultimate River Cruisethat goes from Trier on the Moselle to Budapest.